Cancer cells have the ability to escape our immune system´s defenses – by outsmarting checkpoint molecules on our immune cells. For more than three decades, science and industry have been working to overcome cancer’s tricky battle strategies. The first generation (passive) immunotherapies, monoclonal antibodies (mAbs), do so by supplementing the body with tumor specific antibodies it cannot generate itself (e.g. Herceptin, Avastin, Rituxan). Second generation immunotherapies, so called (passive) checkpoint inhibitors, (like Nivolumab), mobilize the body‘s cellular immune response against the tumour, but unfortunaltey, also to the patient’s own body. This consequently causes an overreaction of the patient´s immune system (“cytokine storm”) and a high risk of autoimmune diseases. Therefore, passive checkpoint inhibitors only have a small window of efficacy and in addition, require multiple treatments per month, which is a big burden for the patient and extremely cost-intensive. 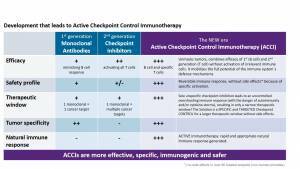 The next generation immunotherapies are therefore checkpoint controlling agents like OncoQR ML’s Active Checkpoint Control Immunotherapy (ACCI). 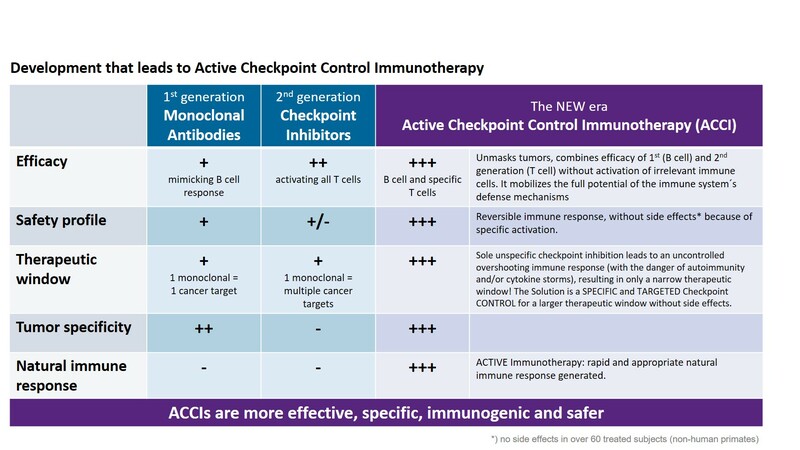 The new era in battling cancer and in cancer immunotherapy is heralded by Active Checkpoint Control Immunotherapy (ACCI). Unlike their predecessors, ACCI´s have the capability to control the immune system´s checkpoints, to activate T-cells specifically (not generally) and to selectively and specifically trigger all four naturally available tumor killing mechanisms of our immune system, everything that is required to battle the specific disease´s mechanism. In short, ACCIs are more effective, more specific, more immunogenic and much safer than any earlier approach. OncoQR ML has achieved in vivo proof-of-concept (PoC) for its two prototype and lead product candidates directed against two major oncology targets: OQR100 (G17/little gastrin) for gastro-intestinal cancers and OQR200 (HER2/neu) for breast cancer. Its proprietary STIR-Platform™ is available for licensing on a target-by-target basis. With its scientifically validated proof of concept, it offers the chance to rapidly develop new vaccines from to design to Proof of Concept within 9 to 12 months.